There is only one thing that the world has in common outside the essentials of food, water, air and heat. We do not agree on values, what is love, or music. Even our attitude towards spirituality, religion, has historically been both unifying and divisive. It is our intangible values that sometimes escalate to wars and killing our fellow man. Sadly, however, tangible assets including money is the only things that is used universally, accepted, and agreed whether in New York or Shanghai, in the middle of the Gobi desert or dealing with your neighbour. We all understand the value of assets, benchmark ourselves and other things with it, and have a sophisticated ways to trade on items based on financial value whether through bartering or using tokens of currency. So when remodelling our interactions and visioning the new world order, why not start with something we can all agree on, and build up from there? We can see the rolling of eyes and shaking of heads; a new vision of the world built on the worst possible instrument of materiality and lowest common denominator of mankind? The very thing that is blamed daily for the ruin of the world. Money. Representing greed, hedonism, selfish and self-centric behaviours that are universally considered vile and demonised in the press. Hardly in line with what society needs to promote – love, happiness, kindness and transparency. The idea of money to unify the world seems ridiculous and out of step with the positive direction we are heading. But what if money, the universally accepted mediator across mankind, can be injected with values that can be exchanged just as easily as currency? A world where hard tangible financial value and soft non-financial value are interchanged seamlessly and a world build capturing all values inherent within society wherever it may lie or extreme it may be. A circular economy trading value built on our values. So how can money be injected with values? It already does. Would you accept $5000 for your shirt if it’s paid in KKK Coins? It may offend your values, or you simply think that since you do not associate with the Klu Klux Klan where could you spend the currency? Currency carries both a financial value and represents values attributed towards a community, a set of beliefs, or alignment of values. Perhaps you can spend it with those who share similar values, who possess Trump Coins. What it does is to create a circular economy based on total value, both financial and non-financial value, and the exchange rate or desirability will be dependent on the demand that a vibrant, transactional and cohesive community creates. Fair or not, abhorrent or not, giving voice to those whose values are repulsive to the rest, a new system of currency that encapsulated all our values is equitable and transparent. We will fight in the exchanges, not in the streets, and we give value to all mankind not artificially censor those who we prefer to supress however unpalatable this may seem. It is democracy built on a common fiscal platform following thousands of years of maturation. The solution is at the centre of the burgeoning 4th Industrial Revolution where Fintech meets Socialtech. The technology is called ‘Blockchain’ and touted as a panacea for all world problems, it nevertheless has some features that truly “smell of teen spirit” – decentralization, democratization, distributed governance and anti-authority. More importantly, the movement of these ‘blocks’ of digital value can carry a vote, a governance layer giving currency the power of consensus. 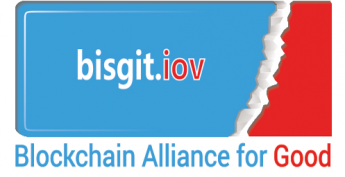 They can integrate smart contracts that determine a transaction of value dependent on third party values. Finally, they can move any kind of value – both financial and nonfinancial – digitally, at a fraction of the cost of existing legacy systems with instantaneous efficiency. Blockchain is promising truly ground breaking evolutions in Humtech, Faithtech, Gendertech, Edutech and many transformative solutions. These articulate through cryptocurrencies which are values based – Women’s Coin, City Coin, EduCoins, Islamic Coin, Leadership Coin, Water Coins, Care Givers Coins, Fashion Coins, EnviroCoins … all contributing to a family of United Nation’s 17 SDG Coins (Sustainable Development Goals) representing us all. So let’s imagine a world where we all hold multiple coins representing the rainbow of our values and the degree with which we align with different communities. The importance is reflected on how ready we are to exchange our coins for products and services. 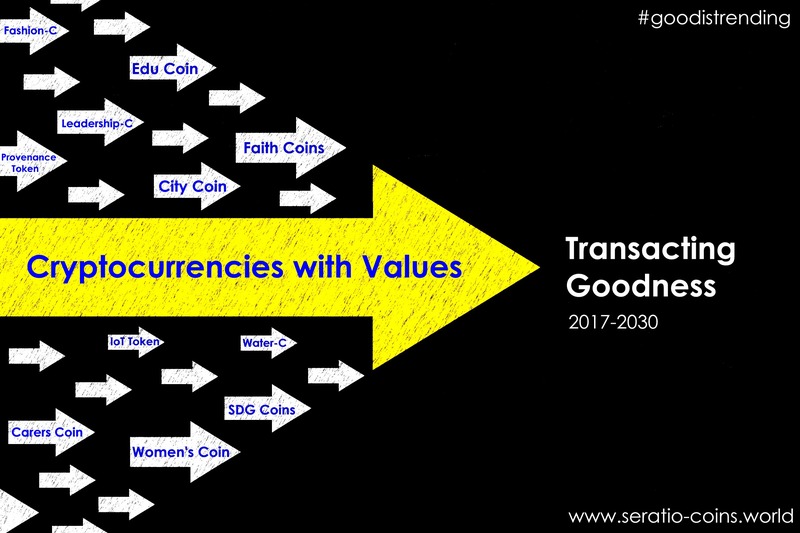 Whilst the financial value within the SDG family of coins are the same, the non-financial tokens of value are different. The latter is a microshare of provenance of ourselves, products, organisations, projects and processes – which can be earned, exchanged and spent dependent on the degree to which we fulfil the values we ascribe to. In future, the exchange rate between families of coins determines the veracity, passion and demand for those beliefs benchmarked against each other. Afterall, what is the use of holding an ISIS Coin if it’s unaccepted in most retail outlets, but equally minority rights are safeguarded as they can champion their own values and spend it within their own communities irrespective of adoption by others. Evolutionary market forces determine what values survive, what grows, and which values becomes extinct over time. The reliance is not on fickle regulations, untrusted judiciary, size of our armies, interpretations, aggression or force, votes, politics, economic strength, or subterfuge. The dependence is entirely on our values, and the belief that positive attributes will rise naturally to the fore and less mainstreamed values will find their natural equilibrium in the grander schema. Bad people can do good, good people can do bad, nevertheless all our values need to be recognised, transacted and tested. We all know the currency of financial value, but what is the currency of non-financial value? At last, we have a means to capture that, and to articulate intangible values as robustly as we have learnt to do with hard assets, in order to build a better world but based on reliable and time served systems.